Ahead for the RTA: Partnership with Uber, income-based fares? As the New Orleans Regional Transit Authority looks for ways to grow public transportation in the city, officials are considering new options such as a partnership with Uber to reach transit lines or a new fare system based on riders’ incomes. 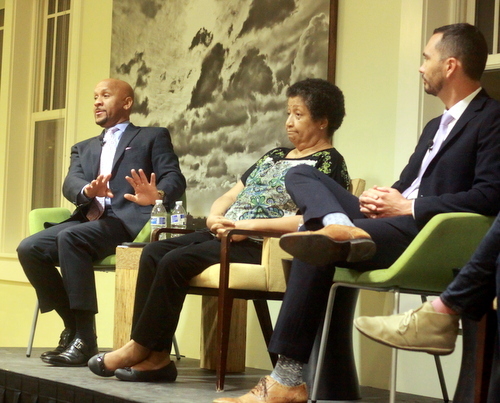 Those ideas and more were discussed by RTA general manager Justin Augustine and other advocates Tuesday night during a panel discussion called “”Intersection: Public Transit, Jobs & Prosperity in NOLA” as part of The Big Issue series at Tulane Hillel. A possible Uber partnership would give the RTA more flexibility and options as a “last-mile, first mile solution,” Augustine said, either getting people to the bus or streetcar stop from their homes, or getting them home from the transit line after they disembark. Such “personalized service” comes with an additional price, of course, but public-transportation systems around the country are experimenting with ways to subsidize those rides, Augustine said. Atlanta integrates an Uber pickup option in their MARTA app, while Portland even includes Lyft pricing on its public-transit app. Around Tampa, riders pay a $3 flat fee for an Uber ride to transit stations, with the agency picking up the rest. Denver is collaborating with Lyft on free rides from its light-rail stations. Transit advocates are intrigued by these kinds of partnerships, said Alex Posorske, director of RIDE New Orleans. Every transit agency has far-flung routes with low ridership, and those could potentially be truncated or even eliminated for significant cost savings if contracting with Uber proves cheaper for the agency. Ride-sharing services have faced accusations of under-paying their drivers, however, and transit unions likely would not take kindly to their employees being replaced in such a way. Uber and Lyft are still relatively new business models as well, Posorske said, and public agencies may not want to stake their futures on them. To bridge those concerns, Posorske said, some communities like Kansas City are using ride-sharing apps to hail public-transit vehicles with the agency’s drivers. Such a compromise may represent a better use of the technology without actually handing over the public service to a private company. Meanwhile, the fares for public transportation have remained at $1.25 for 16 years, Augustine — and really average to only $0.91 per rider after various discounts are included. Part of the reason, he noted, is that the RTA’s governing board does not have the power to change fares — that has to be done by City Council, where there is an obvious disinclination to do so. “There’s real political pressure not to raise fares,” Daniels said. Many cities, however, are now experimenting with sliding price scales for monthly passes, based on riders’ incomes, Augustine said. In fact, many well-off riders — known as “choice” riders — have said publicly they would be willing to pay more for more regular service that would allow them to avoid paying for parking or a private for-hire car, Augustine said, while discounted rates would actually be a form of economic stimulus for “dependent” riders who have no other options. Those options may sound like a pipe dream, but the RTA is about to engage in a major strategic planning process that could turn those goals and other ideas for expanding service into a reality. The kickoff for the new RTA master plan process is next week, and it will likely take 12 to 18 months to complete a document that can guide the RTA’s development for decades, Augustine predicted. “We want to give it time,” Augustine said. The biggest deficiency in the RTA is that it is a rump system that is regional in name only. Shouldn’t the RTA be looking to demolish barriers that restrict the travel of the poor? Ah yes. No better way to diminish the value and freedom of the fantastic Uber model than to partner it with government. You better believe the Federal government is wanting to tap into what Uber/Lyft have successfully built. The day Uber/Lyft partner with government will be the day the pendulum swings.